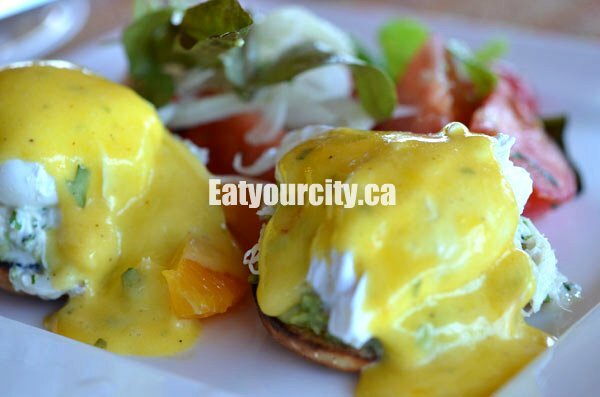 Eat Your City: The Pointe Tofino BC - specializing in local ingredients and a wicked brunch! 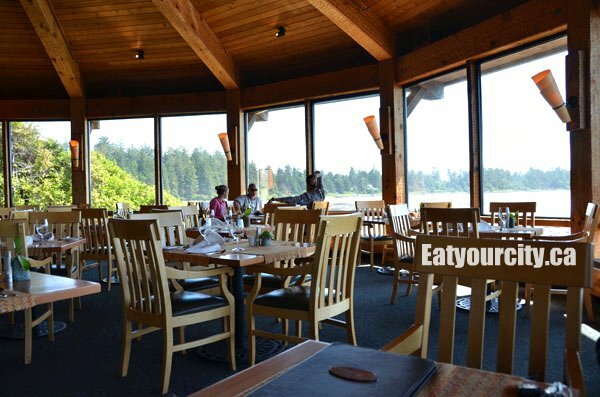 For a family brunch, we head to The Pointe, a restaurant tucked inside the quaint and award winning Wickaninnish Inn - it not only provides a panoramic view of the ocean, they use only locally sourced ingredients from Victoria Island, as well as the ingredients from well known places on the island. Set in an open, airy room, surrounded by golden wood beams, light wood tables and seating, with huge oversized windows that let in plenty of light and the ocean scenery, the Pointe exudes a sense of carefree tranquility. After perusing the menu, some of us went with the brunch items, while others went with their lunch and dinner items. 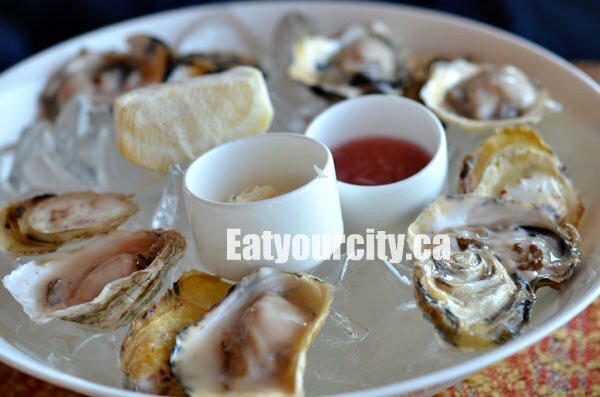 Yup, these oysters would make even Jack Sparrow turn round about and drop anchor. The black pearl oysters were very fresh, not super creamy, but had very sweet notes. They went down very smooth all on their own, but they are served with lemon wedges, fresh grated horseradish and red wine mignonette for those that like to dress up their oysters before slurping them back *Slurp!!! * Nom! 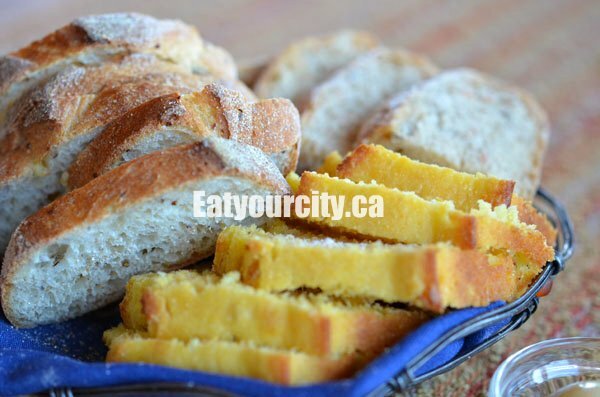 I loooove freshly baked bread, and the loaves baked fresh daily at The Pointe are no exception. 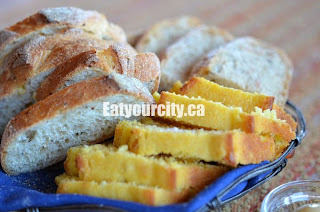 The cornbread was deliciously sweet with bits of corn kernels throughout, and a soft tender melt in your mouth texture. The potato and sunflower seed bread was soft, fresh, warm, and nutty. Simply served warm with whipped butter scooped into a dome like shape.. sooo good!Nomnomnom! 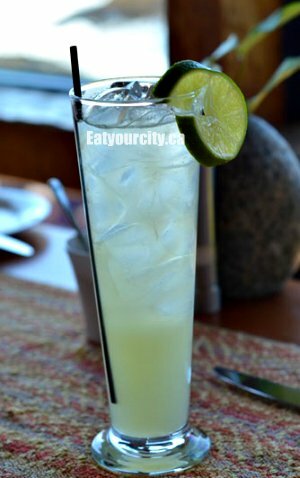 The homemade ginger beer is based on a recipe from Miss Eliza Leslie in 1827. Overall, drink was tasty as there were small hints of ginger in a sweet pineapple juice over a large amount of ice, but not what I expected as most ginger beers are very gingery and provide a strong gingery zing. The small amount of ginger flavor is masked by the pineapple simple syrup added to the beer. I think preferentially, I'd pick up a Crabbies Ginger beer, or the traditional Jamaican ginger beer. Still, it's a refreshing drink to have to sip on while looking out the windows. 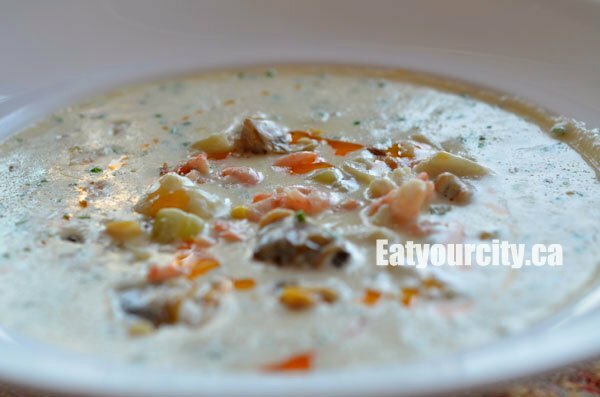 This satisfying chowder was packed full of flavorful goodness. Quarter sized clams, large chunks of carrots, celery, in a very very creamy and tasty broth with a multitude of seafood swimming in it. The "baby shrimp" was on steriods as they were loonie sized, along with large chunks of moist tender fresh white fish. 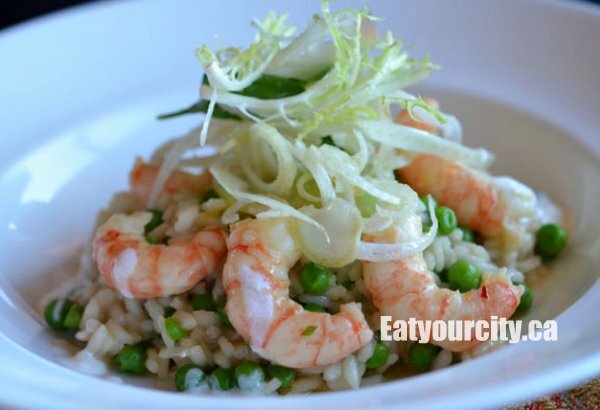 It was garnished with bacon, corn bits and laced with aromatic prawn oil. Mmmmm. This is a chowder that's a meal in itself! The Seared Tofino Salmon is very fresh and cooked to perfection - melt in your mouth tender moist. 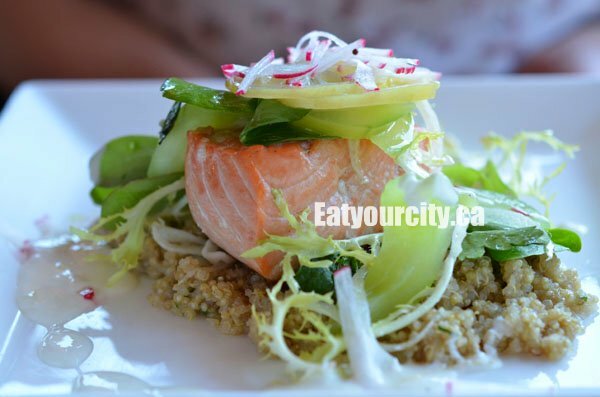 Served with a cucumber and fresh fennel salad and topped with a sorrel yogurt and mint dressing, it was a refreshing contrast to the salmon. Everything was served on a bed of quinoa, which provided a nice salty, healthy (high in fibre + protein) and nutty note to the dish. This risotto was additively delicious. Studded with fresh English peas, lemon and mint, the pot prawns they were topped with were springy and had a very crisp tender mouthfeel. The whole dish was exceptionally savory and creamy, with notes from the broth it was cooked in. Mmmm. The epiphany of comfort food. This takes the casual eggs benny to a whole new level. If you love avocados, you'll loooove this dish - some found the avocado overpowered the delicate sweetness of the shredded crab, while others just loved it. The eggs were pouched to a slightly runny awesomeness, and topped with plenty of rich and creamy Hollandaise sauce. The marinated tomato salad with fresh citrus and fennel it was served with added in a tangy, and sweet note to the yummy affair. We had mixed feelings about the Bison Reuben. The bison brisket cut into thin strips while flavorful, moist, and slightly chewy... tasted like a deli pastrami. Personally, it seemed like a waste of bison because the sauerkraut and horse radish+mustard dressing it was laced in masked the flavor of bison. It was difficult to discern the Gruyere cheese as the sandwich needed a heavier hand on the cheese. The house made sauerkraut was not very sour, slightly crisp, but didn't stand out, so the sandwich was missing a tangy element. The potato and apple salad was a very good pairing. It was light and refreshing, as the apple added in extra sweetness as well as textural elements. We all agreed that this Reuben needed some work: Simplify it down to its elements, and don't overdress up the sandwich. Have bison as a smoked pulled brisket, and don't detract from the sandwich with mediocre extras. We couldn't escape without trying their fish and chips. 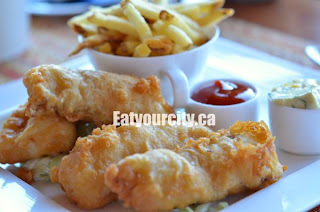 Small pieces of fish was dunked in a Tofino brewery beer batter, fried up and served with a coleslaw, and remoulade. The fish was tender and moist, though the batter didn't stand out, but was passable. The remoulade was tasty, but the fries we felt were cold leftover fries - broken 2inch scraps. I prefer my fish and chips done better at more simple and down to earth eateries in and around Fisherman's Wharf. In any case, they were not worth the $24 price tag. Overall, a picturesque and tranquil place to have a tasty brunch. Plating was done beautifully, with each dish artfully arranged. Stick with the "fancier" fare as they have those well in hand (or pot heehee!). 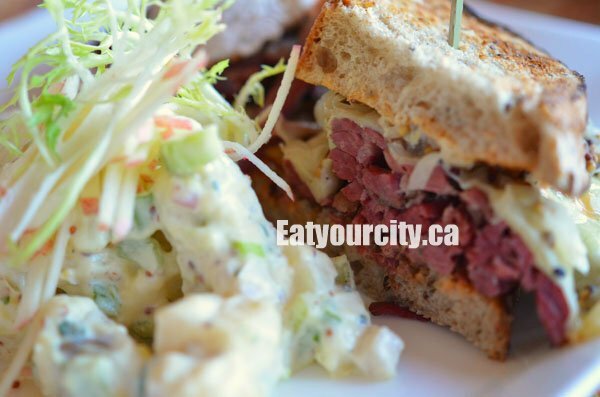 The more pedestrian fare like the Reuben and fish and chips need a bit of work before they reach the execution level of simple fish and chip stands on Fisherman's Wharf.